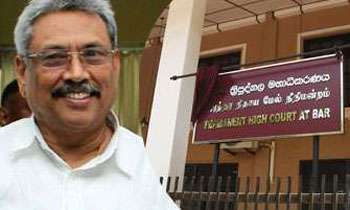 The Special High Court today decided to hear the case against former Defence Secretary Gotabhaya Rajapaksa over the alleged misappropriation of public funds for the construction of the D. A. Rajapaksa memorial museum at Weeraketiya continuously from January 22. Please MS do not interfere. What is the hurry ?? That means no postponements for the flimsiest of excuses? It is the US who can determine whether they would allow you to maintain or renounce your US citizenship. You pledged allegiance and took oaths at the US naturalization process to obey their constitution, to uphold their laws and continue to be a respectful model citizen anywhere in the world beyond the US jurisdiction. So why complain now? Hey low life Gota .Special court to extra burning hell in side prison is waiting for you,We pray at our churches that you die in prison and directed to hell. Holy Jesus, our house is full with killers and the corrupt. Gota is DENIED entry into hell. His announcement for candidacy is like spraying WD 40 into dragging feet!! !